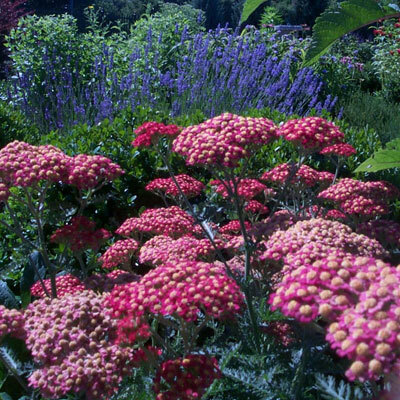 Yarrow herb is a perennial plant. The flowers come in many colors and the leaves, stems and flowers are used in herbal medicine. It is quite beautiful in the garden and very hardy. It can survive severe northern winters in the US. This herb has been used for medical purposes for centuries. There is a greek legend that the ointments were used in the Trojan Wars. Apparently, Achilles used it to stop bleeding in his soldiers. Herbalists in europe, China, and india have used Yarrow herb ot stop minor bleeding and to treat wounds and inflammation. It is also used in the intestinal and female reproductive tracts, in addition to having mild sedative properties. This herb is an anti-inflammatory and also useful in the treament of diarrhea, GI inflammation and stomach cramps. It can reduce smooth muscle spasms which makes it useful for GI conditions. As a result it has been used as a stomach tonic and digestive aid. Blurred vision. Strengthens muscles surrounding the eyes allowing eyes to sharpen focus. Pain. Teas and tincture stop inflammatory process, restore circulation and accelerate healing. Stops pain promoting enzymes. Common cold and flu virus. Combined with echinacea, elder flower, ginger and mint herb in OTC extracts. Bleeding. Poltices can be used to stop minor bleeding. Clean wound thoroughly first, as this herb will stop bleeding fast and may seal in dirt. Topical application long term can cause skin irritation and possible allergic reactions. It may also increase the skins sensitivity to sunlight. Deep punture wounds and severe bleed require medical attention. Do not attempt to treat this type of bleeding with herbal therapy. Yarrow is a uterine stimulant. Although a miscarriage is not likely from therapeutic doses, none the less it should not be taken internally during pregnancy. Women who hav eheavy periods or who have pelvic inflammatory disease also should avoid use of this herb. Acting as a biliary stimulant and increasing bile production, it may caus an increase in gallbladder pain if you have stones. It should be avoided during an acute gallbladder attack, any biliary cirhhosis conditions or any acute gallbladder infection. Alcohol extract of yarrow stops sperm production in mice studies, therefore men who are actively trying to become fathers should not use this.